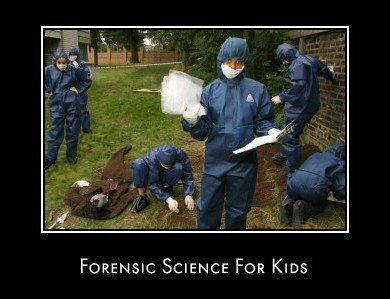 Welcome to the forensic science for kids page. As we mention on the home page we want to make the All About Forensic Science website as accessible as possible and open to anybody, and this includes forensic science for kids. The aim of this page, therefore, is to showcase the best science resources aimed at children and younger students. To all you aspiring forensic scientists out there this page is for you. Many of the links have great resources for teachers as well, so don't forget to tell them all about it. This is a great hands on website with lots to see and do. The games section of the website includes an award winning interactive file 'Autopsy of a Murder'. Through playing the game you will discover all about the world of criminalistics and forensic science. (The game is located under the heading INTERACTIVE FILE ON CRIMINALISTICS about half way down the page). Brilliant science for kids website designed to support creative and fun approaches to science teaching and learning. This is a must visit site for children and younger students interested in learning science. Another very interactive science for kids website from BBC Wales. Includes a number of forensic science related items. ThinkQuest inspires students to think, connect, create, and share. Students, ages 9-19, form a team and recruit a teacher to act as coach. Once the coach enrolls the team, students work together to create an innovative website on any topic within a broad range of educational categories. One of the categories is science and technology and a number of student websites relating to forensic science have already been built. Ask your teacher to take a look at the ThinkQuest website. Participation is free and the top teams in each age division receive laptop computers and a cash award for their school. In addition, the top 3 teams in each age division travel to ThinkQuest Live, an educational extravaganza celebrating their achievements. If you and your friends are into forensic science this is a great way to share your interest with the world. If you do build a forensic science related website don't forget to let us know via the contact us link from the menu on the left and we will publish the details here. Forensic Outreach is a UK based educational organisation covering the fields of forensic science, law enforcement, citizenship, and the criminal justice system. The programmes offered are geared towards the Aimhigher cohort and are linked to Widening Participation initiatives within local universities. Founded and run by forensic archaeologist kimberlee Moran, forensic outreach aims to introduce secondary school students to the concepts of forensic science through summer schools, Masterclasses, and visits to schools by forensic scientists and university students. Forensic Outreach also offers training courses to teachers to help them bring forensic science into the classroom. For more details of this innovative project Click Here To visit The Forensic Outreach Website. An elementary introduction to such concepts as forensics, voice-prints and DNA testing, Detective Science: 40 Crime-Solving, Case-Breaking, Crook-Catching science for Kids activities by Jim Wiese shows how detectives and forensic experts use science to do their jobs. Through a variety of easy, at-home experiments, readers learn how to take and analyze fingerprints, identify blood and detect counterfeit bills (Publishers Weekly). See following link for more details. What could be more exciting than turning your students into super sleuths to discover scientific principles and techniques? 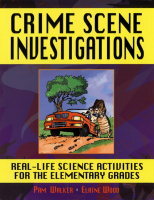 This unique resource for classroom science teachers gives students the chance to become crime scene investigators with 60 exciting lessons and activity sheets in earth, life, and physical science as well as science inquiry and technology. Like real-life forensic scientists, students observe carefully, organize and record data, think critically, and conduct simple test to solve crimes ranging from theft and dog-napping to vandalism and water pollution. And for added fun, original cartoon character Investi Gator enlivens the pages as he sleuths his way through each new mystery, sifting evidence and observing details. Whatever your training or experience in teaching science, Crime Scene Investigations can be an intriguing supplement to instruction. You'll find your students will be eager to learn science concepts and solve a mystery at the same time! See following link for more details. Six intriguing cases introduce your child to forensics – the science of fighting crime. Features: A complete, at-home forensics lab. 6 cases; each more challenging than the last. State-of-the-art lab instruments and storage rack. 200X zoom microscope. Battery operated light table. 2 month manufacturer's warranty. Includes: 4 tire tread casting samples with clay. Fold-out forensics work surface. Rogues Gallery, casebook and instruction booklet. 30 plastic evidence slides. 4 8ml test tubes and laboratory goggles. Latex roller and adhesive. Blood analysis tray. Beaker with lid. 10ml graduated cylinder. Tweezers, stir sticks and pipette. Case Evidence packet includes: 5 fiber samples, fiber identification stain, chromatography paper, synthetic blood samples, 5 ink samples and 7 hair samples. Analyze handwriting, decipher blood type and examine mysterious fibers in your search for the truth. It's engaging, challenging and great fun! See following link for more details. 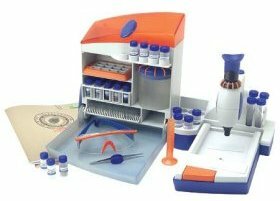 This deluxe science kit lets you extract, view and map real DNA the way forensic scientists do. Explore one of the newest frontiers in science – DNA mapping. 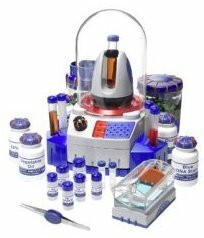 Ideal for budding forensic scientists or secret agents Working lab and tools are just like the real thing. Includes all the supplies needed for six fascinating DNA experiments. See following link for more details.